This is intended to be a complete list of National Register of Historic Places in Clinton County, New York. The locations of National Register properties and districts for which the latitude and longitude coordinates are included below, may be seen in a map. (#82001099) Brinkerhoff St. between Oak and N. Catherine Sts. (#91001673) Clinton Correctional Facility, Cook St.
(#83001664) Court St. between Oak and Beekman Sts. (#99001317) Over AuSable River northeast of Lakeside Rd. (#83001666) Roughly bounded by Vine, Chesterfield, Clinton, Hill, Pleasant, Front, and Beech Sts. (#13000304) Rock & Lyons Rds. (#99000910) 664 Hallock Hill Rd. 44°40′51″N 73°26′42″W﻿ / ﻿44.680833°N 73.445°W﻿ / 44.680833; -73.445﻿ (Old Stone Barracks) Plattsburgh Now converted into a microbrewery, meeting place and bed and breakfast under the name "Valcour Brewing Company"
(#82001110) Roughly bounded by Jay, Hamilton, Peru, and Bridge Sts. (#82001111) 26 S. Catherine St.
(#99001322) Over the Ausable River between Clinton and S. AuSable Sts. (#82001113) Beekman and Cornelia Sts. 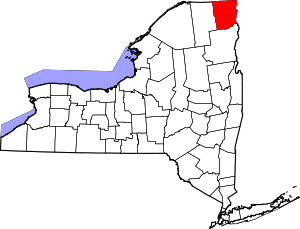 Wikimedia Commons has media related to National Register of Historic Places in Clinton County, New York. A useful list of the above sites, with street addresses and other information, is available at Clinton County, New York, listing, at National Register of Historic Places.Com, a private site serving up public domain information on NRHPs. This page was last edited on 18 February 2019, at 00:19 (UTC).